On Wednesday, April 21st, 2010, at the Miramichi regional Hospital, at the age of 83, passed away Osélie Richard, loving wife of Camille Richard, residing in Rogersville, formerly from Acadieville. Born February 8th, 1927 in Acadieville, she was the daughter of the late Firmin Pineau and the late Marie Rogers. 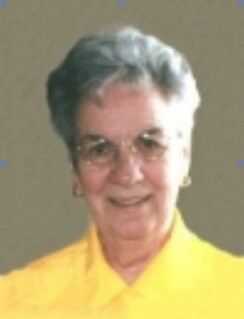 She will be sadly missed, by her husband and also by her two children: Paulette (Roland) Leger of Grande-Digue and Omer (Pat) Richard of Templeton, Mass; one sister, Rose (Phil) Lozeau of Wyoming, U.S.; three sister in law: Eva (late Antoine) Pineau of Dieppe, Therese (late Emile) Pineau of Moncton and Lorette (late Arthur) Pineau of Acadieville; her dear loving grand children: Lynn, Marc, Gabriel and Julie. She was preceded in the grave by one son, Gaston and three brothers: Antoine, Emile and Arthur. The family wishes to thanks Dr Basil Blanchard and Dr Gerard Losier as well as the extra-mural and palliatives care staff of the Miramichi Hospital, also to Camille, Paulette and Omer for the good help and care given at home. The family will be receiving relatives and friends, Monday, April 26th, at the Salon 'La Colombe' 11325 rte 126, Rogersville from 2pm - 4pm and 7pm - 9pm, Tuesday from 2pm until the departure for the funeral service that will be held at the Immaculate Conception RC Church in Acadieville, Tuesday, April 27th, at 4pm.